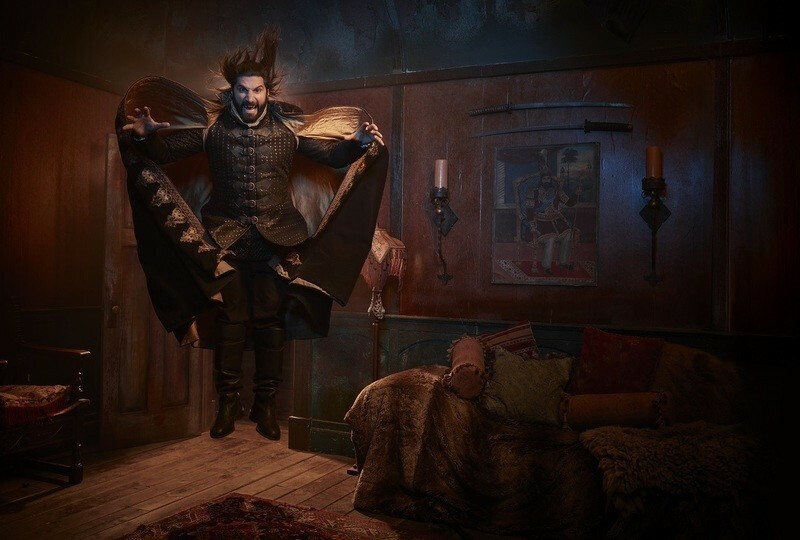 Taika Waititi and Jemaine Clement have adapted their very funny “What We Do in the Shadows” for the small screen, bringing their vision of old-fashioned vampires in a new-fangled world to FX, beginning March 27th. The episodic structure of the film, as well as a concept that could be pitched as simply as “Real World with Vampires,” lend itself to a weekly comedy format, resulting in a smart, funny sitcom that I could easily see running for years. It fits perfectly into FX’s off-kilter sense of humor, and actually gets a little funnier with each episode. If you liked the movie, be patient with the series. It took me a little while to warm up to these awkward bloodsuckers, but they eventually won me over. The series keeps the concept—vampire roommates—but introduces us to new characters in a new location. Nandor (Kayvan Novak) is the gawkiest of the quartet, the kind of people pleaser who buys crepe paper (thinking it’s creepy paper) for the arrival of a vamp VIP. He relies heavily on a human familiar named Guillermo (Harvey Guillen), who has been hoping for a decade now that his master would turn him into a vamp. Laszlo (Matt Berry) was once a powerful lover and leader, but the opportunities to do either in Staten Island aren’t exactly plentiful. Nadja (Natasia Demetriou) has a similar problem as she’s an ancient seductress without much to seduce in the borough. Finally, there’s the hysterical Colin (Mark Proksch), a daywalking energy vampire. Basically, he’s that guy at your office who drains your soul every time he’s near you. A third episode subplot in which Colin meets another energy vampire played by Vanessa Bayer is an early highlight. As the movie was, the TV version of “What We Do in the Shadows” is almost charmingly episodic. Character traits become more familiar, but each episode has its own standalone adventure arc. The premiere features the preparation for the arrival of a famous ancient vampire, including preparing virgins for sacrifice—a funny reoccurring joke about a group of LARPers that includes the great Beanie Feldstein. The third episode resurrects the movie's theme of werewolves vs. vampires in a very funny way. And a great fourth episode guest stars Nick Kroll as the head of the Manhattan vampires, who all seem more stylish and with it than their Staten Island counterparts. I love the idea that not all modern vampires have failed to update their fashions or personalities in the last several hundred years—just this trio of idiots. “What We Do in the Shadows” is a consistent blend of out-there “big” jokes and smaller beats, balancing the two in a way that keeps it moving and feeling fresh. It’s a fast half-hour and a show that I think may get an even bigger following when it’s available streaming as it’s incredibly easy to watch more than one. As any good vampire knows, once you’re turned, it’s hard to stop wanting more and more.